An electrostatic air cleaner is a particulate collection device that removes particles from a flowing airstream using the force of an induced electrostatic charge. 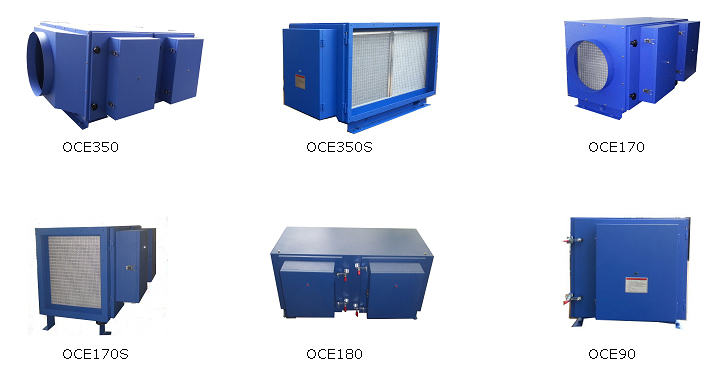 Electrostatic precipitators are highly efficient filtration devices that minimally impede the flow of gases through the device, Pollutants captured by Electrostatic Air Cleaner include welding smoke and fumes, oil mist, smoke and dust, solder fumes, diesel fumes, cooking fumes and many other contaminants. Our Electrostatic Air Cleaners provides an effective, low maintenance air cleaning solutions for many situations. The items over 60 CMM are designed and manufactured subject to the approval of customers. As air enters the electrostatic precipitator, the particles pass through an electrical field that gives an electrical charge to the particles. The charged particles pass through a series of alternately charged collector plates. Particles are repelled by plates with the same polarity and attracted to plates with opposite polarity ? similar to how a powerful magnet works. The scope of application is as below.